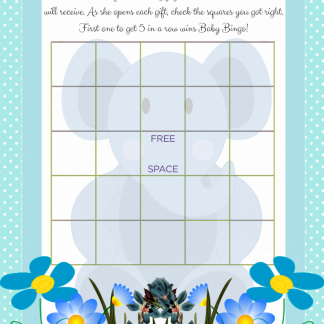 Are you planning a blue elephant themed baby shower for a boy? 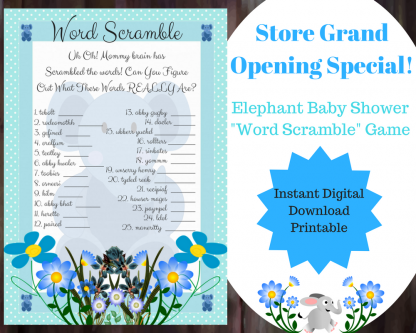 Well, we have designed an absolutely adorable Word Scramble Printable baby shower game themed around a super cute Blue Elephant! Please read the description lower on this page for details before purchase. **This is a printable/digital download. Nothing is being shipped. 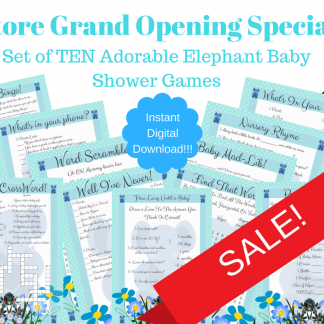 Are you planning a blue/boy elephant themed baby shower? 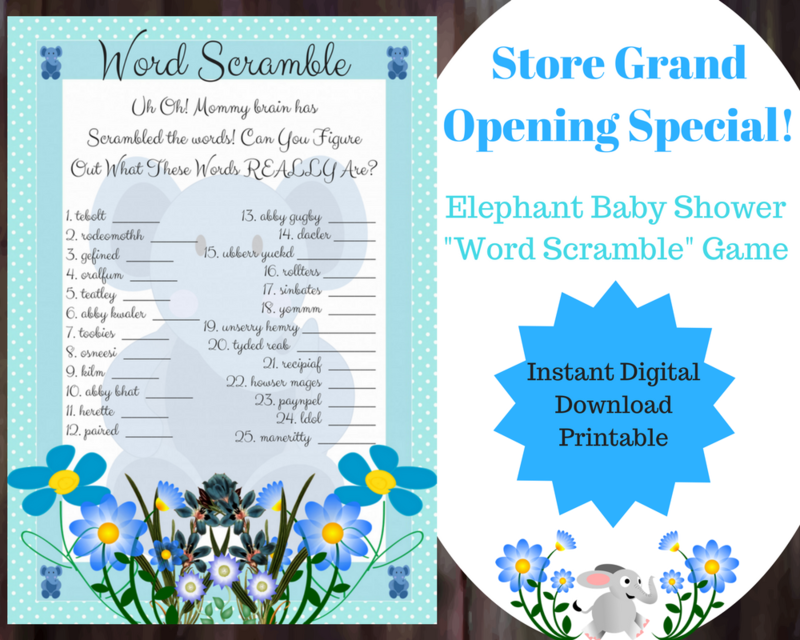 Well, we have designed an absolutely adorable Word Scramble Baby Shower Game themed around a super cute blue elephant! Whenever I design a new digital download product, I like to test it out to make sure that it all works and prints out as designed. The way I do this, is by sending it to my local UPS store for printing. Well, when I went to pick up the tester sets for these games (we have them in Blue, Green, and Pink) I had a little surprise when I got to the shop. I noticed the manager was surrounded by 4 other ladies, all laughing and talking excitedly. I didn’t know what was going on, so I just waited in line to be helped. Finally, the manager saw me and said, “Excuse me, are these your baby games?”. Looking at the counter I realized that all the ladies had been looking at this new game design that you are currently looking at in this listing. I said yes, and then spent the next five minutes answering questions with the ladies and letting them take pictures of the games. Finally, after the other ladies (who were all super sweet BTW!) left, I went to pay for the copies. 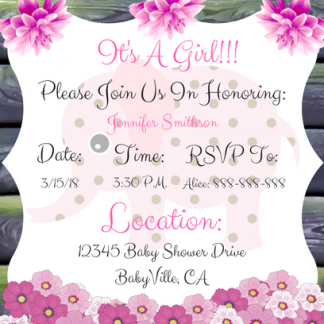 So, if you are wondering if these games will be a hit at your baby shower, I would say based on the reactions of total strangers who had never seen these designs before, the answer would be a pretty solid YES lol. 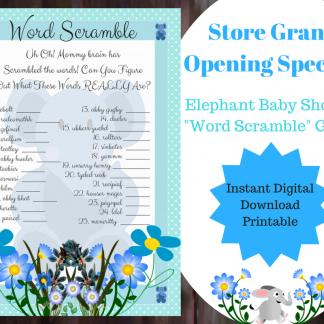 This Blue Elephant Word Scramble Baby Shower Game, comes in a standard A4 print paper size which is 21cm x 29.7cm. It is a high-resolution (300 DPI) Instant Digital Download product, which will come as a non-editable PDF file. You’ll need the latest version of Adobe Reader in order to download the file which you can get for free at www.adobe.com. No JPG, PNG or personalized file formats are available with this product. This product comes as is. Due to the fact that this is a digital item and we cannot track if you have downloaded/uploaded/or copied this item, all sales are final. We do not offer refunds. Therefore, please carefully read individual item descriptions and our Shop Policies. Also, please feel free to ask us any questions you might have BEFORE making a purchase.